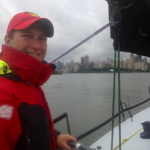 Baltimore MD – Charlie Singer, 19 of Lutherville MD will sail out of Baltimore Harbor Friday morning aboard Temptation-Oakcliff a 50 foot yacht racing to Newport Rhode Island, a step in his quest to become a world class professional sailor. Singer has been selected as one of 15 athletes to train with Oakcliff Sailing, a high performance racing school dedicated to building American leaders through sailing. The unique program trains competitors to excel at the highest level under the most demanding conditions on the water, in the front office and in the boat shop. He applied, was accepted and arrived at Oakcliff ready to grab every opportunity. In the first two weeks he reports he’s having a blast and learning a ton. After finishing his business and architecture education at Tulane University where he is going to be a sophomore, he fully intends to combine his formal education with sailing in some way or the other in his future career. The laid back and enthusiastic kid with a bit of a drawl and a twinkle in his eye is ready to lunge at any and all opportunities that walk by.